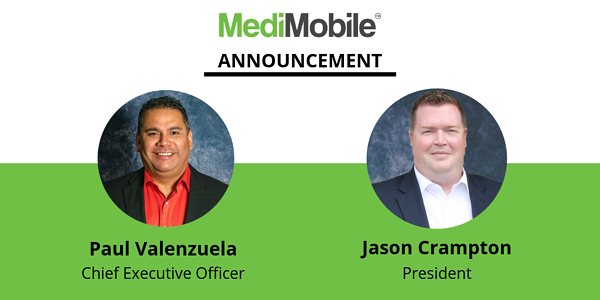 We’re pleased to announce that we have appointed Paul Valenzuela as CEO and Jason Crampton as President of MediMobile. Paul’s and Jason’s appointments are a clear reflection of the company’s current state: ready to take on the future and fired up after another strong year of growth and successful customer engagements. MediMobile is poised for major expansions in the charge capture market and these two officers bring unique experiences in the tech and healthcare world that will enable MediMobile to achieve future goals. Paul, as one of the founders of MediMobile, brings decades of experience from Dell and MediMobile and has a proven record of taking customer-centric technology to the next level. Previously, Paul was the Chief Innovation Officer at MediMobile. Jason brings 20 years of Healthcare experience from HCA, Envision, and MediMobile. He was the National Director of Management Services of Hospital Medicine at HCA. He was also the National Vice President of Hospital Medicine at Envision for 7 years. Jason joined MediMobile in 2018 as the Chief Revenue Officer and led the company to exponential growth. James Enis, our founder and former CEO of MediMobile, will continue to serve as Founder and special advisor to the management team. James was integral in developing a superior Charge Capture application and is responsible for growing the company to where it sits today as a market leader. He is a true pioneer and visionary.